Tom Never was a Wampanoag Indian who was named thusly because he said he would never sell out his people or their land. Local Nantucket whale oil merchants asked him to put his name on their oil so they could avoid paying taxes (Native American businesses were not taxed). 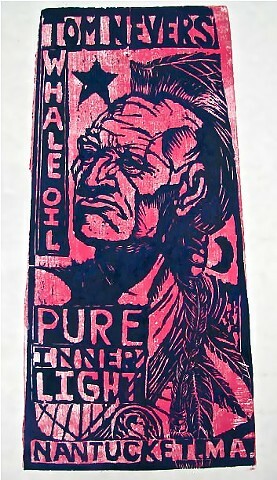 The "Pure Inner Light" refers to both whale oil's famous purity when it burned, and the long history of Quakers on Nantucket. I'm not making any bold, political statement here, it's just "about" Tom Nevers and ACK. I did two images- blue and pink (Nantuket red), and black and red. I need to frame one. Which one do you like? Oh yeah, I have no idea what Tom looked like. The image is drawn from a cast I bought of Black Hawk, so there's a fair amount of artifice here, but that's art. Oh yeah- It's cut into a piece of oak! very, very hard wood, but a great way to get fine detail, and woodgrain in the background. Also a reference to Nantucket. The island was once filled w/ hardwoods, but they were all cut down for fine, historic homes, oh well! The island is now covered in dramatic (in my opinion) scrub oaks, hard dense trees that get blasted by wind to form cool, gothy shapes. The oak was also a metaphor for the steadfastness of the Wampanoags of the island.